Take to the open road with Back Roads California and discover 24 leisurely drives through the states idyllic hamlets, gorgeous beaches and sprawling vineyards. Tour the Pacific Coast Highway, explore the vineyards of the Napa Valley, or drive through Yosemite National Park. Includes insider tips and information, this easy-to-use guide reveals incredible sights, hidden gems and authentic local experiences that can only be discovered by road.Inside Back Roads California:- 24 easy-to-follow driving tours, lasting between one and five days- Guided walks take you through Californias pretty villages, historic towns and national parks- Experts suggest the best activities in each area, from wine tours to watersports- Contains essential travel tips, including our pick of where to stay, eat and shop, plus useful travel, visa and health information- Covers all the US rules of the road - Includes postcodes for use with GPS, plus information on road conditions and parking tips - Covers San Francisco; Sacramento Delta; Marin County; Napa Valley; Russian River Valley; Sonoma Coast; Anderson Valley; Redwood National and State Parks; Cascade Mountains; Santa Cruz; Big Sur; Santa Barbara; Lake Tahoe; Sierra Nevada; Yosemite National Park; Kings Canyon National Parks; Owens Valley; Death Valley National Park; Mojave Desert; Palm Springs; Coachella Valley; Rim of the World Scenic Byway; San Diego; and moreStaying for longer and looking for a more comprehensive guide to California? 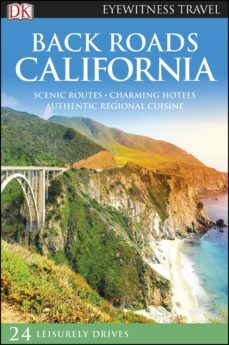 Try our DK Eyewitness Travel Guide California.About DK Eyewitness Travel: DKs award-winning Back Roads guide books take the work out of planning a road trip, with easy-to-read maps, tips and tours to inform and enrich your journey. DK is the worlds leading illustrated reference publisher, producing beautifully designed books for adults and children in over 120 countries.